LiveScanLabs can submit FBI fingerprint cards (FD-258) electronically to the Florida Department of Law Enforcement (FDLE). 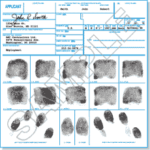 Our Fingerprint Card Scanning service can be performed for individuals not currently living in Florida but requiring a Level 2 Livescan background check. All completed fingerprint cards are processed with us of delivery, FDLE can process the fingerprints within five business days and the intended recipient (State Agency). Please note: Every transactions needs an ORI#. To obtain this number please contact the agency who is requesting the background check. Have your fingerprints rolled onto two FBI (FD-258) fingerprint cards at a local police department use the FD-258 Fingerprint cards provided by a law enforcement agency. Download the Information form for LiveScan. Complete this form and include the ORI#. NOTE: If ORI# is not included it will delay processing. Copy of Driver License and second ID with you name on. *Note: Please do not fold or bend the fingerprint card(s) when mailing them to FastFingerprints. Also, please mail them in a large envelope.